Many Nutritional Therapists and their patients are interested in the effects and consequences of altered hydrochloric acid (HCL) production by virtue of the high frequency of proton pump inhibitors that are prescribed annually – $13.6 billion world wide sales in 2009. These medications are designed to limit the production of HCL and reduce gastric distress. They have potent anti secretory effects on gastric acid. They block the terminal step in acid production by irreversibly inhibiting the function of the hydrogen-potassium adenosine triphosphatase present on the luminal aspect of parietal cell membranes in the stomach. Most patients accept the consensus view that their GI symptoms are related to an excess of HCL not a deficiency and take these medications willingly. The consequences can be an increase in gastric infection from B12 deficiency, Clostridium difficile, SIBO, increased risk of death, increased risk of fracture. 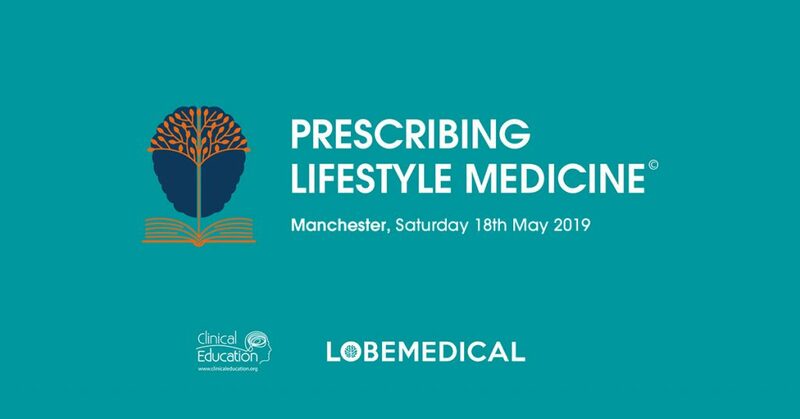 Antony Haynes reviews the mechanisms and investigations that can assist you in supporting your patients and help define their need to supplement HCL due to a relative deficiency or to continue to manage their condition through inhibition. Gastric acid is a colourless, watery, acidic, digestive fluid produced in the stomach. It is one of the main solutions secreted, together with several enzymes and intrinsic factors. In chemical terms, it is an acid solution with a pH of 1 to 2 in the stomach lumen, consisting mainly of hydrochloric acid (HCl) (around 0.5%, or 5000 parts per million), and large quantities of potassium chloride (KCl) and sodium chloride (NaCl). Gastric acid is produced by parietal cells (also called oxyntic cells) in the stomach. Its secretion is a complex and relatively energetically expensive process. Parietal cells contain an extensive secretory network (called canaliculi) from which the gastric acid is secreted into the lumen of the stomach. These cells are part of epithelial fundic glands in the gastric mucosa. The pH of gastric acid is 1 to 2 in the human stomach lumen, the acidity being maintained by the proton pump H+/K+ ATPase. The parietal cell releases bicarbonate into the blood stream in the process, which causes a temporary rise of pH in the blood, known as alkaline tide. The resulting highly acidic environment in the stomach lumen causes proteins from food to lose their characteristic folded structure (or denature). This exposes the protein’s peptide bonds. The chief cells of the stomach secrete enzymes for protein breakdown (inactive pepsinogen and renin). Gastric acid activates pepsinogen into the enzyme pepsin, which then helps digestion by breaking the bonds linking amino acids, a process known as proteolysis. In addition, many microorganisms have their growth inhibited by such an acidic environment, which is helpful to prevent infection. Gastric acid secretion happens in several steps. Chloride and hydrogen ions are secreted separately from the cytoplasm of parietal cells and mixed in the canaliculi. Gastric acid is then secreted into the lumen of the oxyntic gland and gradually reaches the main stomach lumen. Chloride and sodium ions are secreted actively from the cytoplasm of the parietal cell into the lumen of the canaliculus. This creates a negative potential of -40 mV to -70 mV across the parietal cell membrane that causes potassium ions and a small number of sodium ions to diffuse from the cytoplasm into the parietal cell canaliculi. The enzyme carbonic anhydrase catalyses the reaction between carbon dioxide and water to form carbonic acid. This acid immediately dissociates into hydrogen and bicarbonate ions. The hydrogen ions leave the cell through H+/K+ ATPase antiporter pumps. Carbonic anhydrase is a zinc dependent enzyme. The highest concentration that gastric acid reaches in the stomach is 160 mM in the canaliculi. This is about 3 million times that of arterial blood, but almost exactly isotonic with other bodily fluids. The lowest pH of the secreted acid is 0.8, but the acid is diluted in the stomach lumen to a pH between 1 and 3. 1. The cephalic phase: Thirty percent of the total gastric acid to be produced is stimulated by anticipation of eating and the smell or taste of food. 2. The gastric phase: Sixty percent of the acid secreted is stimulated by the distention of the stomach with food. Plus, digestion produces proteins, which causes even more gastrin production. 3. The intestinal phase: The remaining 10% of acid is secreted when chyme enters the small intestine, and is stimulated by small intestine distention. Gastric acid production is regulated by both the autonomic nervous system and several hormones. The parasympathetic nervous system, via the vagus nerve, and the hormone gastrin stimulate the parietal cell to produce gastric acid, both directly acting on parietal cells and indirectly, through the stimulation of the secretion of the hormone histamine from enterochromaffine-like cells (ECL). Vasoactive intestinal peptide, cholecystokinin, and secretin all inhibit production. The production of gastric acid in the stomach is tightly regulated by positive regulators and negative feedback mechanisms. Four types of cells are involved in this process: parietal cells, G cells, D cells and enterochromaffine-like cells. Besides this, the endings of the vagus nerve (CN X) and the intramural nervous plexus in the digestive tract influence the secretion significantly. Nerve endings in the stomach secrete two stimulatory neurotransmitters: acetylcholine and gastrin-releasing peptide. Their action is both direct on parietal cells and mediated through the secretion of gastrin from G cells and histamine from enterochromaffine-like cells. Gastrin acts on parietal cells directly and indirectly too, by stimulating the release of histamine. The release of histamine is the most important positive regulation mechanism of the secretion of gastric acid in the stomach. Its release is stimulated by gastrin and acetylcholine and inhibited by somatostatin. The carbonic acid instantly decomposes into carbon dioxide and water, then gets eliminated through urine. In hypochlorhydria and achlorhydria, there is low or no gastric acid in the stomach, potentially leading to problems as the disinfectant properties of the gastric lumen are decreased. In such conditions, there is greater risk of infections of the digestive tract (such as infection with Helicobacter or Vibrio bacteria (Vibrio is a genus of Gram-negative bacteria possessing a curved rod shape, several species of which can cause food borne infection, usually associated with eating undercooked seafood. Typically found in saltwater, Vibrio are facultative anaerobes that test positive for oxidase and do not form spores). In Zollinger-Ellison syndrome and hypercalcaemia, there are increased gastrin levels, leading to excess gastric acid production, which can cause gastric ulcers. In diseases featuring excess vomiting, patients develop hypochloraemic metabolic alkalosis (decreased blood acidity by H+ and chlorine depletion). On June 6, 1822, an employee of the American Fur Company on Mackinac Island, named Alexis St. Martin, was accidentally shot in the stomach by a discharge of a musket loaded with a duck shot from close range that injured his ribs and his stomach. Dr. Beaumont treated his wound, but expected St. Martin to die from his injuries. Despite this dire prediction, St. Martin survived – but with a hole, or fistula, in his stomach that never fully healed. Unable to continue work for the American Fur Company, he was hired as a handyman by Dr. Beaumont. By August 1825, Beaumont had been relocated to Fort Niagara in New York, and Alexis St. Martin had come with him. Beaumont recognised that he had in St. Martin the unique opportunity to observe digestive processes. Dr. Beaumont began to perform experiments on digestion using the stomach of St. Martin. Most of the experiments were conducted by tying a piece of food to a string and inserting it through the hole into St. Martin’s stomach. Every few hours, Beaumont would remove the food and observe how well it had been digested. Beaumont also extracted a sample of gastric acid from St. Martin’s stomach for analysis. In September, Alexis St. Martin left Dr. Beaumont and moved to Canada, leaving Beaumont to concentrate on his duties as an army surgeon. Beaumont also used samples of stomach acid taken out of St. Martin to “digest” bits of food in cups. This led to the important discovery that the stomach acid, and not solely the mashing, pounding and squeezing of the stomach, digests the food into nutrients the stomach can use; in other words, digestion was primarily a chemical process and not a mechanical one. During 1826 and 1827, Dr. Beaumont was stationed at Fort Howard in Green Bay, Wisconsin. In 1828 he was transferred to St. Louis, Missouri. While en route to St. Louis, Alexis St. Martin was ordered to stop at Fort Crawford in Prairie du Chien, Wisconsin to serve Dr. Beaumont’s handyman again. 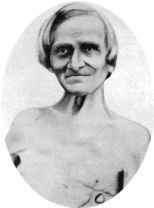 In early 1831, Dr. Beaumont conducted another set of experiments on St. Martin’s stomach, ranging from the simple observation of normal digestion to the effects that temperature, exercise and even emotions have on the digestive process. Beaumont left the army in 1832 and moved to Washington, D.C. There he met St. Martin once again, and performed another set of experiments on how various foods were digested in the stomach. In 1833, Beaumont returned to Plattsburgh where he wrote a book about his experiments on digestion titled Experiments and Observations on the Gastric Juice and the Physiology of Digestion. St. Martin returned to Canada during the spring of 1833, and would never see Dr. Beaumont again, although he corresponded with the Beaumont family; St. Martin died in 1880. In 1834, Beaumont re-enlisted and was stationed at St. Louis. He left the service in 1839, and maintained a private practice in St. Louis until his death in 1853. Beaumont is buried in Bellefontaine Cemetery St. Louis, Missouri. Patients with symptomatic functional dyspepsia (a disorder of digestive function characterised by discomfort or heartburn or nausea) are more likely than people free of this condition to exhibit increased somatisation (conversion of an emotional, mental, or psychosocial problem to a physical complaint), more stressful life events, less belief in religion, and drink less tea, suggests the article out in the European Journal of Gastroenterology and Hepatology. The lead researchers say that this pattern of findings support a less reductionist approach and favours the strategy that includes considering the patient from a holistic view point. The findings of the study suggest the importance of adopting a more comprehensive holistic bio-psycho-socio-spiritual model when dealing with functional dyspepsia patients. The researchers identified factors associated with dyspeptic symptoms by comparing demographic and psychosocial features in individuals exhibiting reddish streaks in the stomach, of whom 93 were symptomatic for functional dyspepsia and 67 asymptomatic. The two groups did not differ with regard to smoking behaviour, alcohol consumption, and coffee intake, but symptomatic patients were significantly less likely to drink tea than their asymptomatic peers, at 37.6% versus 61.2%. Other differences included that symptomatic patients were more likely than asymptomatic patients to be single (20% vs 6%), had less belief in religion (46% vs 66%), experienced a greater number of stressful life events (median of 3.0 vs 2.0) and more severe stressful life events (1.5 vs 1.0). Symptomatic patients also had greater scores for somatisation, depression, anxiety, and psychotism and general severity index of psychopathology compared with asymptomatic patients. The prevalence of Helicobacter pylori in the patients was just 21%, which is lower than the mean prevalence of 54% for the general population, and there was no association between infection with the pathogen and dyspeptic symptoms and so excludes one of the common pathogen explanations. Understanding the characteristics of functional dyspepsia will provide a rationale for the clinician to explain the meaning of the symptoms and to achieve better management. Conclusion: Functional Dyspepsia (FD) with gastric reddish streaks exhibited increased somatisation, more stressful life events, less belief in religion, and less tea consumption as compared with asymptomatic counterparts. The findings of the study suggest the importance of adopting a more comprehensive holistic bio-psycho-socio-spiritual model when dealing with FD patients. Comment: In natural or non allopathic medicine, some reductionists criticise the term holism and dismiss the idea that a patient is any more than the sum of a number of often disparate symptoms. This article is interesting in that the treatment strategy recognises that the complaint is also managed by a number of social and lifestyle factors that when taken in context with the patient is the optimal approach to resolution. Low hydrochloric acid levels are very common. The older you are, the more likely you are to have low levels. 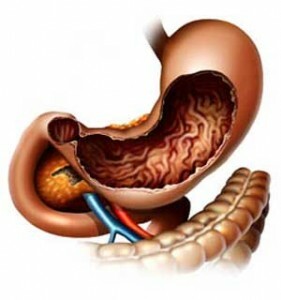 In fact, at least 30% of the population over the age of 65 are low in stomach acid (a condition called hypochlorhydria). There are a number of reasons for this situation, including stress and age. However, another reason is nutrient deficiencies. Low levels of the mineral zinc and vitamins B1 and B6 can also contribute to low levels of stomach acid. Deficiencies in zinc and B vitamins are extremely common either due to lack of intake from food or due to increased needs for example, chronic stress, or due to depletion by alcohol or smoking for example. As we have seen from the functions of hydrochloric acid, it plays vital functions in digestion and if these are not capable of working properly because your stomach acid is too low then you increase your risk for developing food intolerance. However, since the symptoms of low stomach acid are not 100% accurate, but merely a useful guide, it is certainly worth doing a simple home test to prove it. This test is called the Gastro-Test. Your answers to the questionnaire identify whether you should do this test or not. The results of the Gastro-Test identify whether you should ultimately take supplements of hydrochloric acid. A very small minority of people actually have high stomach acid, but this is considerably lower than the number we are lead to believe. The observational questions below help you to identify if you have low HCl acid and support the further investigations discussed below. The Gastro-Test® is a non-invasive FDA approved diagnostic tool for the immediate determination of gastric pH. The Gastro-Test® compares well with gastric intubation in pH determination and in the diagnosis of achlorhydria. The Gastro-Test® indicates the presence of low acid (hypochlorhydria), no acid (achlorhydria) and bleeding (oesophageal or gastric). The test consists of a weighted gelatin capsule with 70 cm of highly absorbent cotton floss attached to one end of the capsule. The test kit also includes a surface marking pH stick and a pH colour chart. Instruct the patient to fast for eight to twelve hours prior to administration of the Gastro-Test®. Water, but not food, is allowed anytime during the fast. With the patient sitting down, the floss-filled capsule is placed in the patient’s mouth. The protruding string, attached to the end of the capsule, can be taped to the patient’s cheek, or held between the patient’s teeth. The patient then drinks one to two cups of water (240 – 480 ml) and swallows the capsule. The patient then lies on their left side for ten minutes. Lying down allows for maximal contact between the floss and the gastric pool. After ten minutes, the patient is asked to sit in a comfortable chair with their head slightly extended. The tape is removed from the patient’s cheek and the floss is withdrawn from the mouth in a swift movement. The floss is then placed on a piece of white exam paper to augment visualisation of the colour change. The pH stick is then rubbed along the moist end of the string and the resultant colour change is then compared to the pH colour chart. A pH of less than 3 on any part of the distal half of the floss indicates that the stomach is secreting hydrochloric acid properly. A pH greater than 3 indicates hypochlorhydria, whereas a pH of 5 or above indicates achlorhydria. If you do have a low level of stomach acid, as proven by the Gastro-Test, then you should also then look to test for the presence of a bacterium called Helicobacter Pylori that can cause this, prior to commencing any hydrochloric acid supplements. 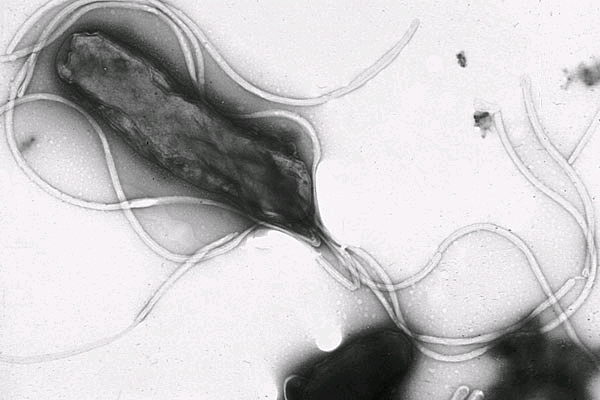 Helicobacter Pylori is the most common chronic bacterial pathogen in humans. It lowers stomach acid levels whilst damaging the mucosal protection within the stomach. It has been attributed as one of the prime causes of stomach and duodenal ulcers. Helicobacter pylori is a gram-negative, microaerophilic bacterium that can inhabit various areas of the stomach, particularly the antrum. It causes a chronic low-level inflammation of the stomach lining and is strongly not only linked to the development of duodenal and gastric ulcers but also stomach cancer. Over 80% of individuals infected with the bacterium are asymptomatic, however. The bacterium was initially named Campylobacter pyloridis, then renamed C. pylori (pylori being the genitive of pylorus) to correct a Latin grammar error. When 16S rRNA gene sequencing and other research showed in 1989 that the bacterium did not belong in the genus Campylobacter, it was placed in its own genus, Helicobacter. The genus derived from the ancient Greek hělix/έλιξ “spiral” or “coil”. The specific epithet pylōri means “of the pylorus” or pyloric valve (the circular opening leading from the stomach into the duodenum), from the Ancient Greek word πυλωρός, which means gatekeeper. More than 50% of the world’s population harbour H. pylori in their upper gastrointestinal tract. Infection is more prevalent in developing countries, and incidence is decreasing in Western countries. H. pylori’s helix shape (from which the generic name is derived) is thought to have evolved to penetrate the mucoid lining of the stomach. Interest in understanding the role of bacteria in stomach diseases was rekindled in the 1970s, with the visualization of bacteria in the stomach of gastric ulcer patients. The bacterium had also been observed in 1979 by Australian pathologist Robin Warren, who did further research on it with Australian physician Barry Marshall beginning in 1981. After numerous unsuccessful attempts at culturing the bacteria from the stomach, they finally succeeded in visualising colonies in 1982, when they unintentionally left their Petri dishes incubating for 5 days over the Easter weekend. In their original paper, Warren and Marshall contended that most stomach ulcers and gastritis were caused by infection by this bacterium and not by stress or spicy food, as had been assumed before. Barry James Marshall, AC, FRS, FAA (born 30 September 1951) is an Australian physician, Nobel Prize laureate in Physiology or Medicine, and Professor of Clinical Microbiology at the University of Western Australia. Marshall is well-known for proving that the bacterium Helicobacter pylori is the cause of most peptic ulcers, reversing decades of medical doctrine which held that ulcers were caused by stress, spicy foods, and too much acid. If you took stomach acid and had H. Pylori then this could produce unpleasant side effects, usually of a painful nature (sore, burning gut lining), which is why it is so important to rule out its presence before proceeding with taking hydrochloric acid. Ask your doctor for a breath or stool antigen test (the latter is more accurate as a marker of ongoing infection) because the blood test cannot tell you whether you have successfully eradicated the bacterium, except after many months (the antibodies remain in the bloodstream for months). If you do have H. Pylori then follow the Anti-H. Pylori Plan (see below), which needs to be taken for 6 weeks, or more in some cases. This is effective in about 80-90% of cases which is equivalent to antibiotic therapy. Two weeks after that, re-test your stomach acid with the Gastro-Test®. again to see if you still have low levels. If you do, then you should also re-test your H. Pylori to see if you are still positive. Finally, when you have eradicated the H. Pylori and you still have low levels of stomach acid you can consider HCl supplements and digestive enzymes. However, some patients will not be able to tolerate HCl for some time afterwards. An intramuscular vaccine against H. pylori infection is undergoing Phase I clinical trials, and has shown an antibody response against the bacterium. Its clinical usefulness requires further study. A 2009 study has found that green tea can prevent Helicobacter-related inflammation. Now a study led by scientists at Beth Israel Deaconess Medical Centre (BIDMC) and the Massachusetts Institute of Technology demonstrates that the amino acid glutamine, found in many foods as well as in dietary supplements, may prove beneficial in offsetting gastric damage caused by H. pylori infection. Reported in the May 2009 issue of the Journal of Nutrition, the findings offer the possibility of an alternative to antibiotics for the treatment of stomach ulcers. H. pylori bacteria infect more than half of the world’s population and were recently identified as a Group 1 carcinogen by the World Health Organisation. Approximately 5.5 percent of the entire global cancer burden is attributed to H. pylori infection and, worldwide, over 900,000 new cases of gastric cancer develop each year. The possibility that an inexpensive, easy-to-use treatment could be used to modify the damaging effects of H. pylori infection warrants further study in clinical trials. In a new study researchers from Clemson University found various grape extracts and their compounds to be effective at inhibiting Helicobacter pylori, one of the leading causes of gastritis in humans. The antibacterial effects of extracts from red, white, black and muscadine grapes as well as the pure compounds resveratrol, ellagic acid, and myricetin were tested for anti-H. pylori activity using agar dilution, laser scanning microscopy and cell proliferation. Following 24 hour treatment, results showed that muscadine grape skin extract had the highest anti-H. pylori effect, followed by muscadine grape synergy and seed extract. Additionally, two of the three compounds, resveratrol and ellagic acid, also inhibited H. pylori. Calcium deficiency in the elderly is associated with low gastric acid secretion and bone loss. A new study linking defects in gastric acid secretion with bone destruction and impaired mineralisation bolsters the view that calcium supplements can prevent these bone defects-but do they all work. This paper suggests that altered acidification of the stomach and specific gene deficiencies will dictate the form of calcium supplementation most suitable for the reduction and resolution of osteoporosis. However, it is not for every patient. Whilst the vast majority of patients with stomach symptoms are candidates for HCl acid supplementation, not all can tolerate HCl, and it can elicit unpleasant heart burn symptoms, or even worse. This is rare, but it is definitely worth avoiding. Start patients on a single supplement in the middle of their lunch, not dinner lest there is a problem that keeps them up all night, and have them gradually increase their dose to the desired level over a number of days. It may be best NOT to use HCl acid in the morning, when the body’s energy tends to be better and it is not needed so much. I also recommend that you ask patients to complete on a 2 weekly basis the symptom questionnaire (shown above) that relate to the low stomach acid, so that some form of monitoring can be in place. The use of HCl supplements is also a good example of why patients should NOT follow any supplement programme for more than a month or two without the specific recommendation of the practitioner. The production of HCl acid is a very energetic one, and therefore anyone with any degree of fatigue is also a candidate for low HCl levels (or a higher pH than ideal). At the other end of the spectrum, I have had a number of patients who can tolerate high doses 700 mg of HCl per caps – with each meal (up to 5 at a time!) without any negative effects; in fact, it has been of great help. These patients would all have started on a lower dose and gradually titrated the dose upwards. Betaine HCl + Pepsin is still probably the most important supplement for digestion. Stomach acid is essential to detoxification. An absence of stomach acid inhibits the liver from releasing bile, which compromises bile flow, which in turn may adversely affect the entire liver and lymphatic system from releasing stored toxins. Hagen SJ, Ohtani M, Zhou JR, Taylor NS, Rickman BH, Blackburn GL, Fox JG. Inflammation and foveolar hyperplasia are reduced by supplemental dietary glutamine during Helicobacter pylori infection in mice. I have found that taking HCL has slightly helped my functional dyspepsia. I can, however, take 700mg x15 capsules on an empty stomach without noticing any burning. Why is this? Is my body neutralizing the acid quickly? Is my stomach producing large amounts of the protective barrier?